In September 2008, I set off with a friend to visit Ireland’s capital. Having never been to Ireland before, we chose Dublin because of it’s vibrance as a city, but also having produced writers such as James Joyce, Samuel Beckett, George Bernard Shaw, William Butler Yeats and Oscar Wilde, there was sure to be a rich literary history. My interest was specifically focused on Oscar Wilde, whose talent I discovered whilst studying my BA in Enlgish and Creative Writing. I was fascinated by a man who was so talented, yet so painfully forward thinking for his own time. The chilling tale of ‘Dorian Gray’ still remains one of the most memorable pieces that he has written, if somewhat removed from the usually light hearted wit of plays such as ‘The importance of being Earnest.’ Wilde, for me, had a way with words that no one has since been able to emulate in quite the same way. So, on preparing to visit Dublin, I began to research the places to visit and began to discover a literary Dublin, beneath the bustling heart of the city. And once we had arrived we were not dissapointed, everywhere you go there are displays of creativity, whether it be singers on the street and artists painting portraits or writers events and night time literary tours. Some of the places we visited included the James Joyce Centre, George Bernard Shaws birth place and the Dublin Writers museum. 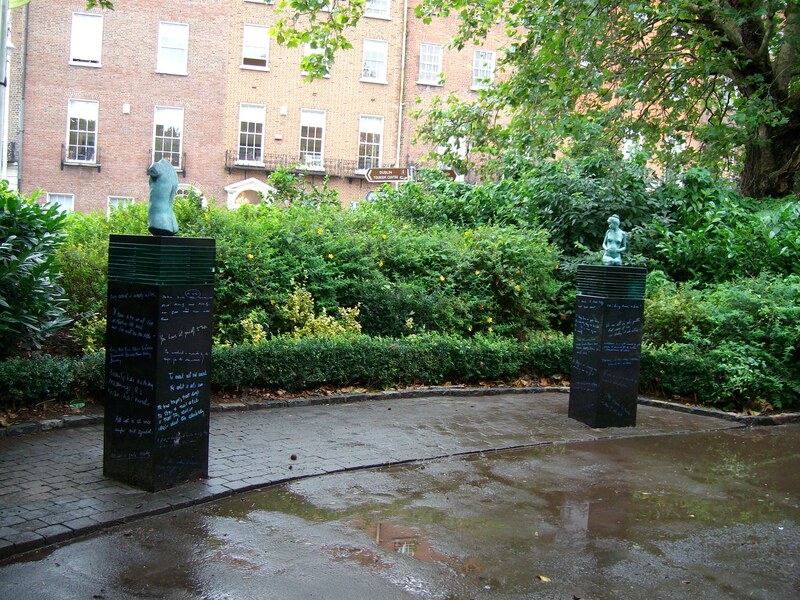 But in search of more inspiration on Oscar Wilde himself, we took a trip to Merrion Square Park (not far from Wilde’s childhood home) where the statue of Oscar Wilde is situated. 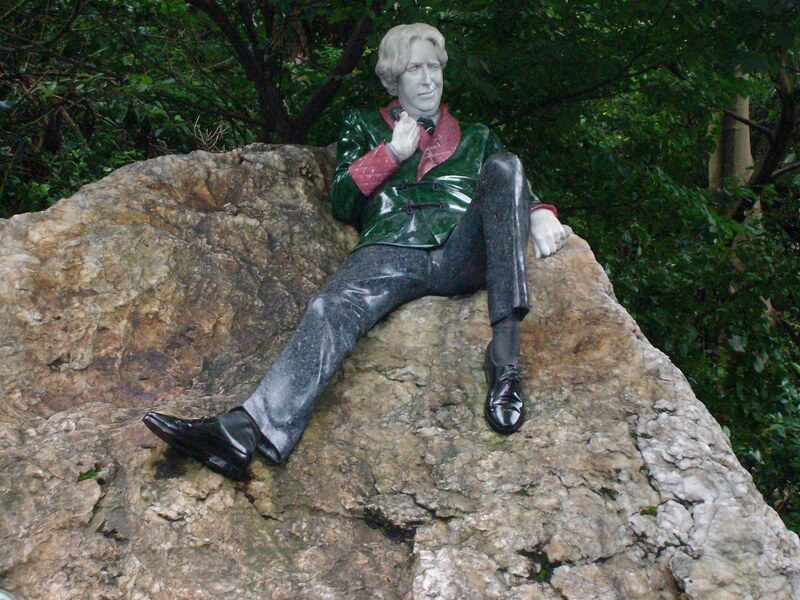 An impressive replica of the writer, mounted on a rock and complete with smoking jacket and pipe, the statue is unusual because it is partially coloured . As you can see below, it is quite extraordinary. It seems to capture the writer’s character extremely well and would probably have quite amused him! Across the walkway from the statue are two pillars covered in quotations from both Oscar’s work and the writer himself. It appears that the quotations are in the writers own writing. 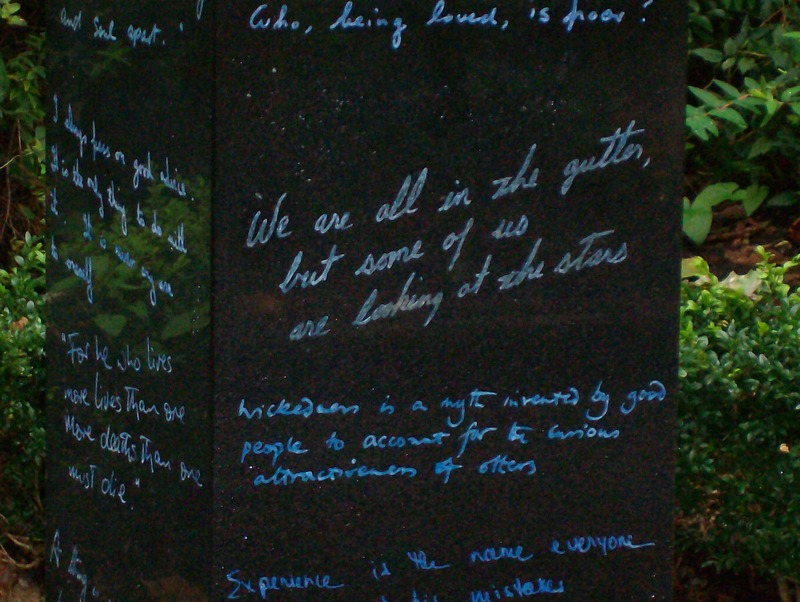 Among the quotations are some of my favourites, such as ‘We are all in the gutter, but some of us are looking at the stars.’ Here is a close up of one of the pillars. This visit to Merion Square Park was one of the hightlights of the trip, but everywhere you went there were references to Oscar Wilde. In the pubs, on the streets, the Irish people were proud of their literary heritage and this remarkable man who had called Dublin his home.